1 oz / 30ml in Violet Glass. Next batch ships immediately. 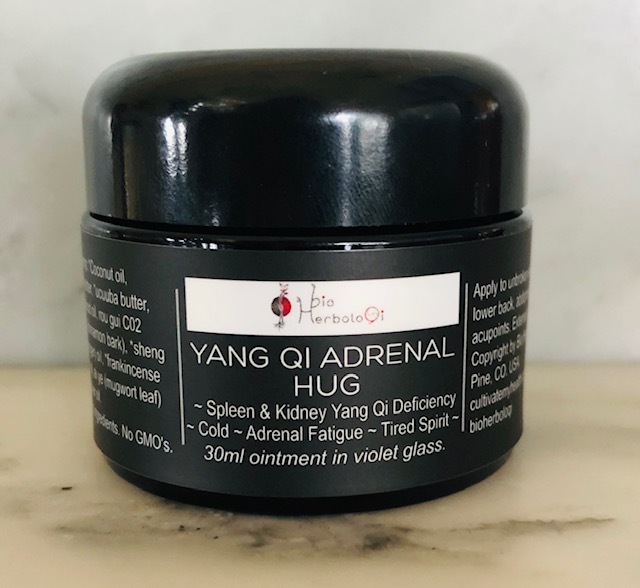 Yang Qi Adrenal Hug ointment tonifies Yang Qi and supports energy recovery from adrenal fatigue. The formula consists of premium herbal oils and C02 extracts like Ai Ye, Rou Gui and Sheng Jiang plus more, that warm the body and qi, build the Yang Qi and support healthy adrenal function, while breaking up phlegm or damp lymph (tai yin). When used for yang qi deficiency, fatigue and cold it is nicely warming especially when applied over the lower abdomen, front or back. It also stimulates LH and FSH for gynaecology and fertility treatments. Chinese herbal oils, essential oils and C02 extracts have been combined with skin nourishing butters. All ingredients are organic where possible. This ointment is 97.5% certified organic by volume, and 100% pesticide free. The skin nourishing butters we use are 100% organic and feel amazing on your skin. 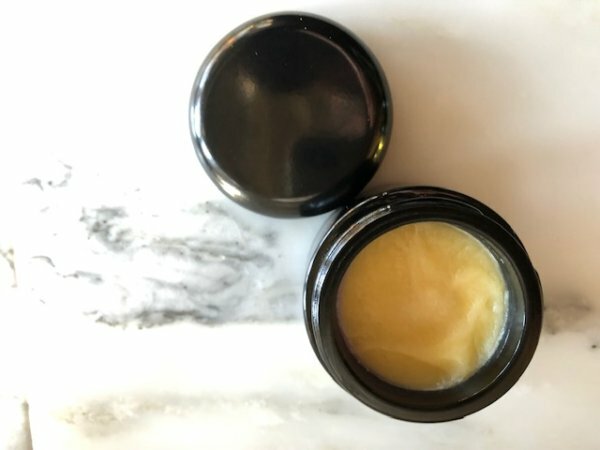 Our unique ointment base is non-greasy, antibacterial, anti-inflammatory, anti-aging, high in Vit A, E, and many other skin food nutrients. Active oils include Rou Gui (cinnamon bark), Gan Jiang (dried ginger), Ai ye (moxa / mugwort), Ru Xiang (frankincense), cedarwood and vetiver. DIRECTIONS: Apply approximately 1/4 teaspoon to the lower back, abdomen, or areas of the body where your skin is colder to touch. You can also apply this to the abodomen for fertility or gynaecology, acupoints along the kidney channel, and those that tonify yang qi, or clear cold. This is enough for an area the size of your two hands. You can also apply a small finger dab to acupoints. After approximately 15 minutes you will notice more internal warmth in the torso and areas applied. It can spread to assist cold extremities even after being applied to the lower torso. This product is quite effective and potent yet the warming effect is subtle, it is not ‘hot’ on the skin. Smelling the ointment can help with emotional exhaustion. For chronic yang qi deficiency or chronic fatigue: apply to the lower abdomen and lower back each morning. For emotional exhaustion: apply it to the lower inner ankle area (kidney channel points), the sternum (KD 21- 27) and the abdomen. If shock or fear has been a major factor, also apply it over your kidneys and lower back. If the spirit or shen is tired, or experiencing compassion fatigue, apply it between the shoulder blades, over the back shu spirit points, (BL42 – BL49). AVOID: Applying it close to the eyes, mouth, or other orifices. It may sting and cause irritation. These statements have not been evaluated by the FDA. This product is not intended to diagnose, treat, cure, or prevent any disease. For further care we recommend Chinese medicine practitioners. 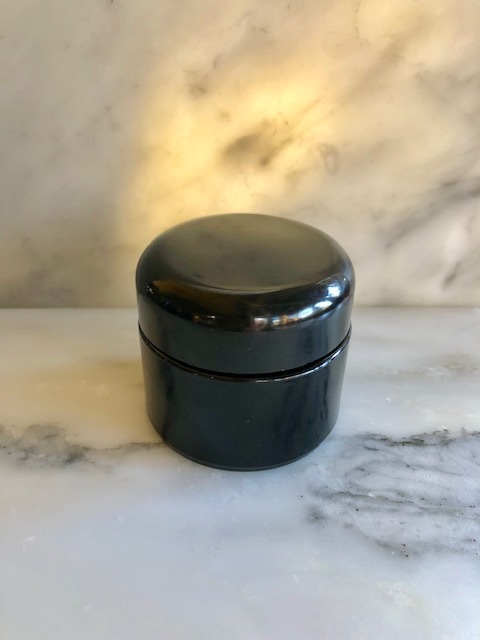 GIFT: We recommend you keep your violet glass container when your ointment runs out. Wash it and reuse it in your kitchen. This dark ultra violet glass appears black but is violet in the sunlight. It will preserve herbs, spices, culinary leftovers, medicinal potions and more. 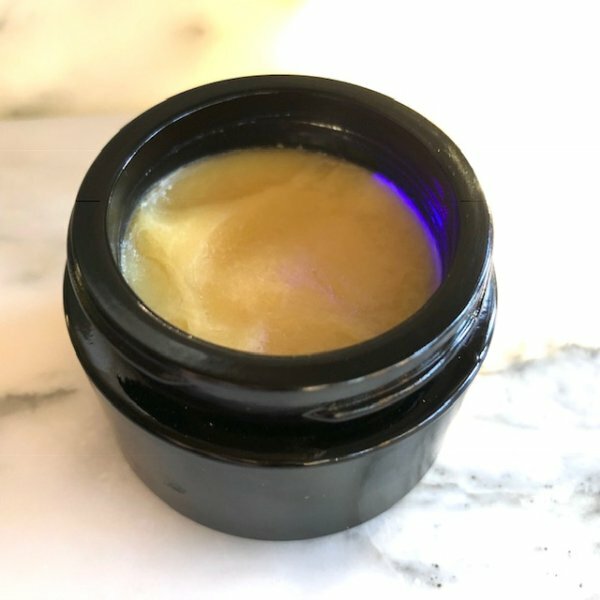 The retail value of the 1 oz /30ml violet glass jar alone is currently around $13. This is our gift for you to keep. The medicine just keeps on going! 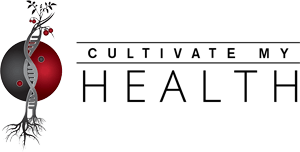 **Coconut oil, **≠Cacao butter, **Ucuuba Butter, **Cedarwood oil, *Rou Gui C02 extract (cinnamomi cortex), **Gan Jiang oil (ginger), **Ru Xiang oil (frankincense carteri), *Ai Ye oil (artemisiae argyi folium), **Vetiver oil.